Kate and Chuck are available for your party, wedding, dance, festival, concert, celebration, opening or other festivity. Please call 207/288-5196, or email for information. ...From the Celtic Highlands through New England to the Blue Ridge Mountains. Kate Wegner and Chuck Donnelly have developed a musical form based on the age-old Celtic dance-music traditions and their close musical cousin, Old-time-music from the American South and Midwest. Music, like any language, evolves over time and geographical areas as people migrate and cultures intermix. In Europe, Celtic music, in one form or another, has roots in Ireland, Scotland, Wales, the Isle of Man, Cornwall, Brittany, and parts of Iberia (Spanish and Portuguese regions). 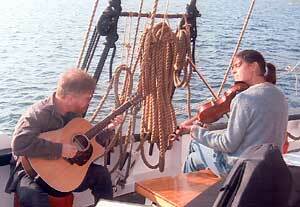 Many early American settlers brought Celtic musical traditions with them. Over the past few centuries the music continued to evolve and develop into distinctive regional styles. A particularly distinctive musical style evolved in the American Southeast where African slaves introduced the banjo (made from gourds, wood, and gut strings) to the Celtic music brew. Canada (most notably Cape Breton, Quebec, and Newfoundland) also hosts regions of well-developed and distinctive Celtic music traditions. In each region the music has been passed on from generation to generation, learned by ear, and largely left unwritten and undocumented. In the past 30 years or so, many books have been published preserving many of the tunes for future generations. New England, being "on the road" between Celtic Europe, Canada, and the American Southeast, has developed its own "Celtic" music style that is influenced by the Old-time music of the South and the music of Canada and Europe. In Maine, the Celtic music traditions are re-awakening after a period of decline. A small but growing community of musicians in Maine are now re-energizing New England's music style and once again the music is evolving in the spirit of its traditional roots. In her early 20s, Kate Wegner, from Wilton Maine, is already one of Maine's new influential fiddlers. Kate is actively writing traditional-style music, recording, and performing regularly in a guitar/fiddle duo with Bar Harbor guitarist, Chuck Donnelly. In concert, Kate and Chuck take you on a journey of traditional and original tunes that weave together the fabrics of the Celtic and Old-time traditions into new musical forms that are at once familiar and yet "uniquely Kate and Chuck." Kate and Chuck often play on the "edge." They keep the energy of each performance high through spontaneity. In some cases they will switch tunes or the musical approach to a tune as the mood of the music and audience demands. 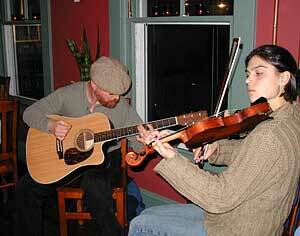 But, of course, all of the tunes are played in Kate and Chuck's distinctive style with plenty of artistic license. Kate and Chuck also perform with their Celtic Fusion band, a high-energy band that brings a full drum kit (Russ Snyder) and electric bass (Sig Eschholz) into the Celtic Old-Time Fusion mix. When the band is hot, the theater rocks! © 2004-2006 Kate Wegner. All rights reserved.